What are macro signals telling investors about the second-longest bull market in US history? In this episode of “The Exchange,” Raoul Pal and Julian Brigden, of Real Vision’s Macro Insiders, discuss interest rates, market volatility, and the business cycle, in an effort to determine if we’ve finally reached an end-of-cycle top. Filmed on July 3, 2018 in Dallas. Let's be frank, Central Banks have no choice but to support the markets. We're not in a free market anymore. There's too much leverage in the system. There's either going to be a full reset or it's money printing. The only thing that will break this cycle is revolution and then Breton woods 2. Really anecdotal and general overall. They made a lot of references to 1999 or 2008, but didn't present any graphs to illustrate. Why is inflation in Japan going to happen? Some good points, but a lot of general comments they could have illustrated better. The same Raoul has been crying foul for over 2 years. Yes, you will eventually be right, but listening to you would mean missing out on 25% rally (let market correct by 33% and I am still neutral on losses). It was only recently in March, when he talked about GOOG warning bear signs. I hope they acknowledge, retrospect, and do a full show on why they were so wrong, and the implications it has had on our portfolios.. I've been a RV subscriber for a long time and I think this discussion was absolutely fantastic and look forward to the forthcoming series. The addition of Roger who is clearly both extremely well informed and passionate about macro was a stroke of genius by the founders. Well done, guys. Spot on. This was a brilliant overview of where we are. These guys do some quality thinking. I am however concerned that Roul living in Grand Cayman has lead to a too relaxed dress style of T shirts and Bracelets for a serious finance Dude !!!!!! 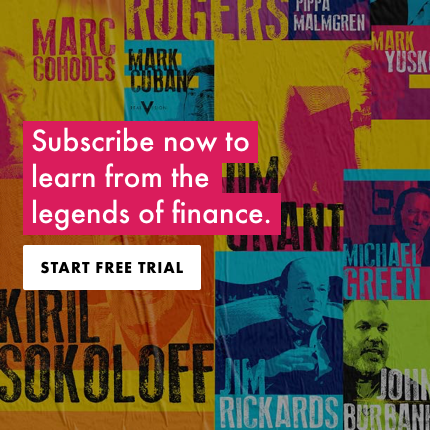 This looked like a great discussion, but due to my having never worked in the industry professionally and not knowing anything about Bonds yields, curves, rates, swaps, treasuries and all the other pillars of Macro, 90% of it just went over my head. But it sure sounded cool! I beg... again... please... could you make a series of educational videos that explain all these basic concepts and how they interlace and how they make macro? In a real simple apples and oranges kind of way. Would be vert helpful. Thanks. I will be blunt. So excuse me. I'd surmise that the vast majority of the people paying for this content are professionals (advanced knowledge and expertise) and "amateurs" who are keen personal investors (I fall in the latter category, albeit fairly young...30...)...The reality is that we don't come here to learn basics. We come here to learn complex view points and see if it adds to our current knowledge or challenges our preconceived notions...not to learn basics. Every point of "basics" you've outlined can EASILY be learned on ones own time with a a few quick searches on the internet and some reading. With all due respect, I hope RV never goes the way of focusing on beginner information - that stuff is widely available for free for those who are keen on learning it. This content is for pros and avid amateurs who wish to hear the pros speak, complex uncommon jargon and all. I take your point. There is a lot of free content out there. ALL that matters to me though is how prescient it is. Personally I could nt care less as to the manner in which it is explained. These guys are very forward-looking and often right (sometimes in the end). Great job, gents! I saw your recent Macro Insiders video, which covered much of the same ground, but still found this helpful. We subscribe to all your services, and they are paying for themselves. We would welcome any tickers that you can offer (e.g., long US $, short euro). Thanks, and keep up the good work. Brilliant conversation, great video format. Not sure if I really liked this video. In general the topic of the discussion is good and interesting to hear. However I hear a couple of times Julian saying with we send this to Macro Insiders members and we already warn them about this coming up and that this was going to happen according to our models.. Not sure how much added value those comments are if you arent a member of this service. Also I notice whoever doesn't agree with Julian is a "Dude". Anyways, looking forward to the next episode. Am sure it will be better! Brilliant discussion and further clarifies what I have been learning from Macro Insiders. With regards to the structural shortage of dollars, what is to prevent the Fed continuing with their policies yet maintaining stability in the global system by creating swap lines on a massive scale? Raoul is excellent as usual. Same for Julian. A truly great duo to help connect the dots. Great interview. Can I request for 30 minutes or longer conversations could you include a short summary write up as well for key take aways? I watched it again... so the dollar shortage is deflationary for everyone except for the USA because in the US there is a supply shortage caused by over- stimulus ... I think this is the message. The dollar shortage due to dollar hoarding and that’s causing deflation or a liquidity trap. This was excellent guys, great convo with great insights. Helped provide some perspective and information to us from a younger generation. Keep it up. Firstly I need to be respectful of three guys that most probably have been more successful in the markets than I ever will be, so on that point kudos to them. That all said I find such conversations of limited value, not due to any lack of respect, but because there is no real insight provided into their daily processes from which they formulate views and conclusions. This is not the forum for masses of words, but there is a very simply way to at least get a handle on the forces at play within Global Macro as follows. For those that have a Bloomberg, it's very easy, but thinking that most do not a low cost alternative is to go to a site such as https://tradingeconomics.com/. Pick the country or region of choice and look for YoY rate of change of GDP and secondly YoY rate of change of Inflation. The idea being we're looking to understand is GDP and in turn Inflation accelerating or decelerating on a year over year basis. We can then go a stage further and look for YoY rate of growth in company earnings, identifying which sectors are showing accelerating growth and those that are not. With this insight it's possible to at least start to understand where in the World capital will flow to and in turn know where to invest. The aforementioned are but just three simple examples of process. I would only follow recommendations if the process from which the conclusions were derived is articulated. I'm a self-directed investor/trader with no relationships with any company or individuals within the Finance industry i.e. I'm a nobody in the grand scheme of things. I've only ever provided input on trading and investing to immediate family and friends. I don't have a blog and my online presence is almost zero. Well put Mike T! And with some practical advice for a top-down macro process. Think 90% of traders (retail or institutional) who stick with the simple but effective method you described would fare well to profit between the 30 yard lines on the field (assuming tops and bottoms are at the end zones). For those who want to use more of the field as their canvas, then they will need to develop their own macro econometric models; but few, even armed with all the calculus, can really beat out the index or do better than the process you described. However, many of these sub-index performers do scribe material for great reading and exposition about the markets. I have laid out my process very clearly on Real Vision, Macro Insiders and GMI over the years. If you arent an MI subscriber then I'd suggest that you watch my "How I use the business cycle" video that I posted a few years ago. it goes through everything in great detail. Hopefully that helps. R.
Raoul, I wasn't suggesting you don't have a process, only that conversations of the type featured in the video have limited value which stress is not meant to be dis-respectful in any way. I watched the business cycle video a couple of years ago when I first subscribed. Your real process of course can only be revealed for a fee. Mike, I see your point, but this round-table is an overlay or update on some earlier themes discussed in more depth in earlier videos and written pieces. I actually think the speakers do explain their process, or at least as much as is allowable in the time available. Not all buybacks are bad. Like the managements that authorize them: some create value, some destroy value. The amount of misinformation about this topic from supposedly sophisticated professionals is astonishing. @Alex R. All buybacks are retarded! Companies should never buyback their shares. The capital was raised for a reason. Instead any free cash should be used to pay all debts, and then if there is nothing to invest in, then pay back as DIVIDENTS. Share holders DO NOT benefit from buybacks. It's just a paper profit. Until the moment the shares are sold, the currently traded price of the shares is meaningless to a share holder! Add to that the fact that the buybacks always happen (by definition) during the best of times, so when the prices in the markets and economy are highest so it is a waste of capital. The best way to distribute the profits that the company makes would be through dividents. I do not invest in stock market so I'm impartial to it, yet these are the basics of business and I'm astonished you fail to get that. Perhaps you have never run your own business? Buybacks increase the leverage of a firm. This increases the return on equity and the value of each share for shareholders. If you see interest rates will be extremely low for the next 5 years it makes sense (credit is far cheaper than equity funding). Of course with more leverage comes more risk. But also we have a Fed which is extremely pro active in supporting the market on the tiniest of corrections. I don't think they suggested that all BBs are bad. The point is that this is being pushed to an extreme, and also what it is signalling as more is going into this, rather than investing in Capex (growth) and while companies have record volumes of leverage. It is the extreme nature of BBs that is the issue. at this rate, the day when Julian and Raoul throw in the towel we would have seen the peak lol. great exchange guys really enjoyed it, for those who haven't yet, I would strongly recommend checking out macro insiders! They thought us in university the economists were of two kinds: Keynesians & Monetarists. The formers leaning on-demand push policies, while the latter leaning on supply-side policies. Non-sense. There are only two kinds: macro and micro. Everybody is in the macro camp nowadays. IMO Austrians are the only one in the micro camp - e.g, human action, praxeology etc. They are not popular because they don't give solutions to real problems (Daniel Lacalle, recently said). Maybe they don't have an answer because there is no answer? What is the right "neutral rate"? What is the current "quantity of money"? Where should the dollar go? Who knows... What I know is micro. It is human action at its best. That's why I'm in the inflationary camp. Any man in the same chair of Jay Pal will have two options soon. One is a hard one but the other is even harder. Which one will he choose? Stagflation. The world is trying to deleverage! It has been trying to deleverage for 20 years now. But no, they won't allow that to happen. Asset bubbles everywhere. Young kids overburden with student loans and jobs that required a Ph.D. but pay less than what their parents used to make as primary teachers or assembly-line workers. They can't buy a house in Flint, forget about Caymans. They live in their parents' basement and save hard for that house deposit. It is all useless as the inflation goes up faster than wages and their saving rate. That's Trump for you. That's populism. Central bankers will use the final weapon of mass destruction one day soon and by trying to inflate the next asset bubble with whatever they call it - helicopter money, QE 1000, NIRP etc - they will kill the currency. I agree. We are going to read it all in the economic textbooks. All this foolishness. There is also Behavioural Economics which is a micro economic framework that works for macro too. Personally, I think it will win out in the end (in a blend of Austrian, Classical and Keynes). They sdont have to be mutually exclusive but a lot is too model driven and not practically driven. My guess is that the business cycle can be explained by Behavioural factors above all. Excellent conversation and love this new format. But agree with Amit that there were very few, if any, actionable ideas here. But perhaps that wasn’t what you meant to achieve with this. Buy bonds, buy dollars, sell EM and get ready to sell developed equities. Couldnt have been clearer. Its all about buying bonds, buying dollars, selling EM and getting ready to short stocks. Raoul are you married? All my girl friends want to know? Great discussion too! I hope they are hot for Raoul's sake. Hahaha... No, Im not married anymore. It is one of the biggest determinant of one’s happiness but ironically it is one of the things that one has the least control over. Very good. Hopefully, before the US becomes Zimbabwe they remove the Plunge Protection Team. Price discovery is dead. We have a generation that has no idea what the cost of money is. Strategy remains being short while hedging long with options only. Micro is the new Macro until whatever is going to happens, happens. We all know when the trap door opens it will not be during the day and the FED will be under their desk. This is meant in the nicest possible way: you are in danger of becoming the video edition of @zerohedge. Are there dangers out there? Yes, of course. Are they worthy of discussion? Most certainly. Are we nearing some macro inflection point? Probably, there is a decent probability of that. Do these points take time to develop? Yes, they do. Should you warn of them? Doubtlessly so. Are the three "Ds" going to be a factor at some stage? Yes. Are they today? Not so much. By this I mean that you should trade what is in front of you, not what you think could happen at some point in the future. And you should at least mention it and acknowledge today's reality. By all means, tell us what you think is going to change it and what the trigger points will be. That certainly would be useful. At the moment we are still in one of the biggest bull markets in history. Earnings growth is huge. Technology is changing the world faster and faster every day. And the market has already responded. Sector rotation is at an extreme. Look at what XLP has done against XLK just this year. Traditional value stocks are as cheap as chips. This is not the stuff bear markets are made of, because you have already had a bear market in traditional stocks. Look at a chart of XLP. We could be in a churn of sector rotation, we could be readjusting PEs to reflect higher future IRs, we could be doing a lot of things. The S&P 500 overall will only fall into a bear market if a dozen tech stocks give up the ghost and as such the S&P has become irrelevant to serious investors. And whether IRs are at 3 or 4% is unlikely to cause it. We could have witnessed the death of traditional macro, as far as that is concerned. You could be worrying about something that has already died. The point about narrow breadth is well taken but when we have the fastest acceleration of technology in the history of mankind, is this particularly odd, or completely logical? I can certainly envisage that one day in the next couple of decades we will have one tech company worth more than the entire US stock market put together, or even more than the entire Rest of the World. If someone masters AI and Robotics, what will that be worth? More than everything on this Earth combined, for sure. Probably 100s of times everything else on Earth. And whether IRs are 3, 4, 5 or 100% will make no difference. The real danger here is not being too invested in "stocks" but being invested at all in the wrong sectors and not invested enough in the right sector. As such, traditional macro could well be defunct in spotting what is really going on. Far from saying that today is different and leaving it at that, I have explained the difference: the rally is entirely 2 sectors (K & Y) and everything else is actually down. 100% of YTD SPX rise can be attributed to 10 shares. Which is precisely my argument. We are potentially headed into a period where 495 stocks could be at $0 and the SPX will still be much higher. Therefore looking at ONE index as a market measure is no longer relevant and has not been for years. That is what I mean by traditional macro being dead. The old way of looking at the DJI or SPX as spreads to other assets is being killed by the acceleration in technology which is producing new industries and entire economies at a speed never before seen in human history. And it will get much faster still. This is concentrating the performance into fewer and fewer names. For a logical reason. As far as buybacks, how many shares have AMZN or NTFX bought back? If you look at the 10 stocks accounting for 100% of the SPX performance, the total buyback is peanuts as a % of total. All that traditional macro can now do is flatten or exacerbate the parabola of growth of leading stocks. If someone perfected AI, would you care what 30yr bonds were yielding? You would buy the stock regardless. And if he said that he only takes payment in Zimbabwe Dollars, that would be the strongest currency in the world. Regardless of what traditional macro would look at, like comparable IRs. As a final point: take the stocks that composed the DJI in the 80s or 90s (find approximations where impossible) and look at the ratios they are trading to bonds/PEs/any other matrix you care to mention. They are very reasonably priced. No excesses whatsoever. That is why calling a top is almost impossible. The overwhelming majority of stocks are very reasonably priced. The indices are elevated due to a dozen big winners. Predicting if/when they will top out is almost impossible using traditional macro. I cant find a fund in my retirement account that doesnt over-invest in one, or several, or all of these top dozen IT firms. Can anyone recommend a good macro fund manager available to Australians? Ellerston - based in Sydney and run by a pretty impressive former Tudor PM H2O Allegro - London-based, French fund. It's a UCITs though so should be available worldwide. Its returns have been phenomenal: http://www.morningstar.co.uk/uk/funds/snapshot/snapshot.aspx?id=F00000M91O I would actually love to see their charismatic CEO interviewed by RV one day as they are fantastic / European specialists. check out Daniel Want and Prerequisite Capital. Guys - a Question: is this trade war about to export deflation to the rest of the world (i.e. ex-US world)? Displaced Chinese goods will need to go somewhere, so assume there will be some goods dumped in other markets for a while to clear inventory while production adjusts. Thoughts? Hey it is that picture guy from knock on effect. Great exchange. I will say that I think this bull market will die hard. It is not going to happen overnight because most of this rally has been buybacks, and the retail guy is having some serious fomo. This could be the peak of the cycle, but as far as being a comfy short, it may take awhile. Marc Faber agrees with you. Rather than a crash, a grind lower over a number of years is a possibility, in his eyes. This was an excellent discussion with excellent questions. Addressing at the difference in bond views was appreciated. Good description of macro picture and comparing to 2000, 2008. Would love to hear more about Stock buy backs. This is the first video that I know of where this was mentioned in some detail. More people should know this. Perhaps a complete video on it. Raoul's comment about the yen was great, as it broke through resistance today. It would have been interesting to hear how much farther you think EEM has to go. Great discussion. Does anybody know of any resources to learn about what happened leading to and during the asian financial crisis in 97 (and the order of events)? Thx! Top quality, just don’t understand how anyone could downvote this. Their strongest view is that DX will rally further as driven by a structural dollar shortage. The only driver of this shortage that was mentioned was lower US trade deficits. But they have been worsening since 2016. So what else is behind this thesis of a structural dollar shortage? Note: the tax cut, higher US relative rates and repatriation effects are not classed by them as being structural. Is the other structural driver of dollar shortage the high EM indebtedness which precludes the creation of more USD loans? Structural is the foreign debts in dollars, almost everything else is a catalyst but trade deficit could become structural, if Trumps policy get traction. I'm so fascinated by macro. Thank you for this piece. I wish there was more time for a deeper discussion. Great work guys! Any bets who this cycle Maddoff is? The Federal Reserve FIAT system. cycle my arse - this could very well be the fall of Rome! FYI - the 2 yes only TWO - remaining triple A rated S&P stocks -http://fortune.com/2016/04/26/exxonmobil-sp-downgrade-aaa/ HEY RV - time to through the mic back to Harry Markopolos for a timely update! - anyone agree? It is in the self-interest of large pension funds to address the problem of executive compensation by stock options. Putting pressure on the boards of directors, especially when corporations borrow to buy stock, is one of the few pressure points. If the problem continues the large shareholders could reduce or eliminate these shares in their portfolio. DLS. Rao is so lean! Whatever you are doing keep it going! Please stop The Exchange sign sweeping thru the picture. Rest, all great stuff and we have been warned. Love the enthusiasm and confidence. Thank You. Great discussion with two of the best. Thankyou for an updated version of the balance of the year. your content keeps getting better and better. It would be great if you could address Lyle K. question as this has been on my mind as well. "The Exchange' format is a really great addition to the 'one on one' interviews. Value On RV !! Great format, even better content. I really do appreciate listening in on that one. This is the most helpful content for me. Discount MI a bit and I will buy. Thanks gentlemen. Love RV but I think you guys are a early... here is a statistic that you probably never heard of, their has not been a negative yr in the S&P in the 3rd yr of a U.S president since 1939 in fact the 3rd yr of a presidency is statically the best yr.
Did all those 3rd years have 25-50Billion dollars a month of liquidity being removed from the market? Zero percent chance we get a recession in the next yr American economy is doing great. Agree US is doin "Great Again" (!) but how much greater can it get? Biggest takeaway for me is the supply constraint point: US is at full employment - best case is that we get a Henry Ford-style lift in wages, which leads to consumption-driven inflation, rather than supply constraint + tariff driven inflation which decreases real consumption. Consumption-wise: Where is the next government-driven impulse coming from? We'll be cycling the current one in a year, but I think share markets peak well before then. Personally yes - I think the SPX can go higher, simply because I lived through 2007/2008 (net short from August 2007) and the trade feud has the short term folks positioned short, but Super Tanker America takes a long time to turn around, so the upcoming earnings season will be just fine. After that all bets are off (and I reserve the right to change my mind in 30 seconds flat). Watch the junk bonds which have been fuelling a lot of the buybacks. Looking vulnerable. Stay Bayesian people! Great idea! I would suggest (hope) for a few such events in accessible venues around the world in major cities in the U.S., Europe and Asia. If both of them have a video like this daily, I believe Netflix will be overtaken by $RVTV. Nice one! If you could make these sessions regular that would be amazing. A totally absorbing exchange that I could have watched for hours. These are exciting and nervous times in markets and I really appreciate getting as many insights and views as possible to help me formulate my investment strategy. Thanks RVTV for the excellent exchange series. Excellent discussion, until the "Volatility is cheap, buy some calls" moment at the end. Calls expire and get exercised and then you have a position. And/or you have just paid premium for nothing. But I know what Raoul meant. Unfortunately for most people who own a 70-80% stock allocation in their pension fund, it is much more complicated than that. I am at 92% since the Feb blowout and all I can do is continue to sell calls and hope to time it better later. I am highly doubtful I will be able to but we have very little choice, don't we? This is because volatility is NOT cheap. Volatility is actually very expensive if you measure it against the only thing that counts in the real world if you are running a pension portfolio: realised volatility. The spread between realised and implied is near historic highs. Overall very helpful, thank you. As you may know, writing calls is the same risk as shorting puts. You may find writing calls gets you into trouble. Absolutely loved this! The best exchange segment yet, with two of my favourites in Raoul and Julian. It would be great to have you two back in September/October when you expect the market to turn down sharply, to see where we are. A question, is there a metric or metrics for tracking financial conditions in the Eurodollar market? When I see answers like the above it reminds we need a forum! Lots of smart members here. Jeff Snider is good, but i can never understand what the hell he is talking about. There's no "TLDR" takeaway - really dense stuff.